Even behind bars, serial killer Harvey Day Smith exudes menace. Psychologist Jolene Granger has agreed to hear his dying confession, vowing not to let the monster inside her head. 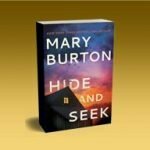 And Harvey has secrets to share—about bodies that were never found, and about the apprentice who is continuing his grisly work. . .
Saturday, April 6, 11:00 a.m. If Texas Ranger Brody Winchester had come to see Dr. Jolene Granger on personal business, he’d have come with hat in hand. He’d have been ready to eat a heaping helping of humble pie, or better yet, crow. But this visit wasn’t personal. He’d not come to apologize or to make amends. He had no intentions of digging up the past or rubbing salt in old wounds. This. Was. Business. He parked the black Bronco in the recreation center’s parking lot and shoved out a breath. He reached for his white Stetson on the passenger’s seat, took a moment to level the silver Concho trimming on the hat’s base before setting it squarely on his head. He stepped out of the vehicle, straightened his shoulders and eyed the large box-shaped building. The sign above the double glass doors read:AUSTIN ROCK CLIMBING GYM. As he stared up at the sign, he wondered if the boys back at headquarters were having a good laugh at the new transfer’s expense. The Jo Granger he’d known hated heights and if anyone had bet him she hung out in a place like this, he’d have taken the bet, damn sure he’d win. ’Course, he’d not been face-to-face with Jo in fourteen years. And time changed plenty. Dr. Jolene Granger was no longer a wide-eyed college student but a psychologist who consulted with the Texas Rangers. In fact, her expertise on violent behavior had landed her several television interviews last year when the reporter had been digging for the motivations driving a serial killer that had hunted along I-35. He’d seen on television that she’d given up the peasant skirts and flip-flops in favor of dark suits, pencil skirts and a tight bun. Always wore white pearls around her neck. Reminded him of a librarian he’d had in school as a kid. Cool. Controlled. Hot. Yeah, she’d changed in fourteen years. Maybe heights didn’t bother her anymore. A couple of laughing teens wearing shorts and carrying gym bags raced past him through the front door. He trailed behind them, finding himself in an industrial-style lobby tricked out with a cement floor, solid crate furniture and soda machines. He moved toward a long narrow reception desk where a young guy was texting. Dark hair swept over a thin pale face and tattoos covered every bit of skin exposed below his white T-shirt cuff. If Brody had been in a more charitable mood, he’d let the kid finish his nonsense communication, which likely had to do with gossip or a party. But a foul and dark disposition sapped all patience. Jo had always coaxed this kind of loyalty out of folks. Kind, smart as a whip, she drew people. The kid was no different and Brody gave him props for standing up to him. He softened his scowl. “Dr. Granger isn’t in trouble. But my business is official. If you don’t mind, I need for you to get back behind that counter and take care of your own business.” He took a step toward the kid who hustled back behind the counter. As Brody turned toward the main gym he imagined the boy on his cell again, texting his friends as fast as his thin fingers could move. In the main gym, Brody was greeted by the smells of sweat and freshly polyurethane-coated floors. The walls were covered with gray rocklike facings that jutted and curved as a rock ledge might. Dispersed over the wall were colored footholds and handholds, some large and others so small he wondered how his large hands could maintain a grip. A collection of climbers scaled the walls from the floor to ceiling. Belayers stood at the bottom feeding climbers their safety ropes. A young blond girl scaled the wall as if she were part monkey. A couple of guys in their mid-twenties moved between the rock ledges with a power and grace he admired. He couldn’t imagine that fourteen years had changed Jo so much that she now enjoyed this kind of foolishness. The shouts and giggles of a group of girls in a side room drew him. The ten girls, who looked to be between fourteen and sixteen, stood at the base of a tall rock wall. Several were pregnant and most had tattoos and piercings. Young, but he imagined they all had a lifetime of experiences already under their belts. There was no whiff of anger or sorrow radiating off anyone. They were cheering, like kids their age should. His gaze trailed theirs to a woman racing a male climber to the top of the rock wall toward a bell. He’d found Dr. Jolene Granger. Brody stood behind the students, rested his hands on his hips and shifted his gaze from the male climber to the woman. Her chalked fingers clung to slivers of manufactured rock while her feet perched on similar pieces. Tight black pants and a white fitted spandex top molded a trim athletic body. Long red hair bound into a ponytail swept across her muscled back as she scrambled haphazardly from rock to rock. Jo? He looked closer. Damn, if it wasn’t her. The girls laughed, shaking heads and pointing to each other. None fessed up to having any doubts about her. A rumble of laughter and whispers rolled through the teens. “Yes!” they shouted. The male climber rang the bell. He regarded Jo, his good-natured appreciation clear as he nodded his concession. Brody assessed the man, wondering if Jo had really beaten him or if he had held back to win points with Jo. If he had to wager, he’d put his chips on the latter. “Doug buys ice cream for everyone!” Jo said. Brody crossed his arms over his chest, taking inventory of her high cheekbones, pale complexion and full lips. She was more relaxed, and a hell of a lot hotter than the grim woman he’d seen on television last year. As if she’d read his mind, her gaze shifted from the kids to him. For a moment she stared at him, as if she couldn’t believe her eyes. He made a point not to blink or show the faintest sign of curiosity for this new version of Dr. Granger. Shaking off her surprise, she moved to climb down the wall but missed her handhold and, in a blink, fell. The girls squealed. Brody tensed, moving toward the crowd, ready to shove his way toward the wall’s base. But the rope tightened, halted her fall and the bilayer held tight. Jo immediately grabbed for another rock and swung herself back into position on the wall. For an instant, she didn’t move. “You okay, Jo?” Doug said. She moved through the crowd of girls. Several stopped and asked her again if she was okay. She assured them all she was fine. Her back was straight and her gaze direct as she finally cut through the crowd and closed the distance between them. Wisps of hair framed her face, which had grown more angular over the years. Though she’d always been slim, her body now was trim and nicely muscular. No hint of apology softened green eyes now as sharp as emeralds. The years had been good to her. And he was real glad. The last time he’d seen her she’d been…broken. “Are you getting arrested?” one shouted. “No, ma’am.” He spoke loud enough for all to hear. He’d been a Texas Department of Public Safety officer when he’d collared Smith. But the arrest had been the coup that earned him his Ranger’s star. The Texas Rangers were an elite group of one hundred and forty-four men and women in the Department of Public Safety. Brody’s jaw tightened and released. He’d used every trick in the book to get Smith to open up but endless hours of interviews had been a waste. Smith had taken pleasure in jerking his chain. She dropped her gaze to the ground, shaking her head. — RT Book Reviews, 4 stars on NO ESCAPE. 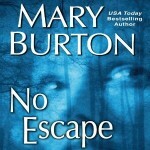 “Mary Burton embraces the dark side of humanity . . . engrossing . . . a chilling thriller . . .a climax that is terrifying . . .excellent entertainment.” — Long and Short Reviews on NO ESCAPE. 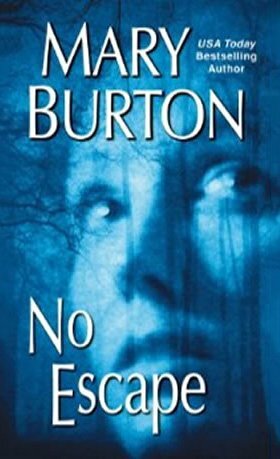 Burton always writes great, edgy suspense, and this book is no different. Pages will fly by as the danger around Jolene and Brody increase!” — The Parkersburg News & Sentinel on NO ESCAPE.